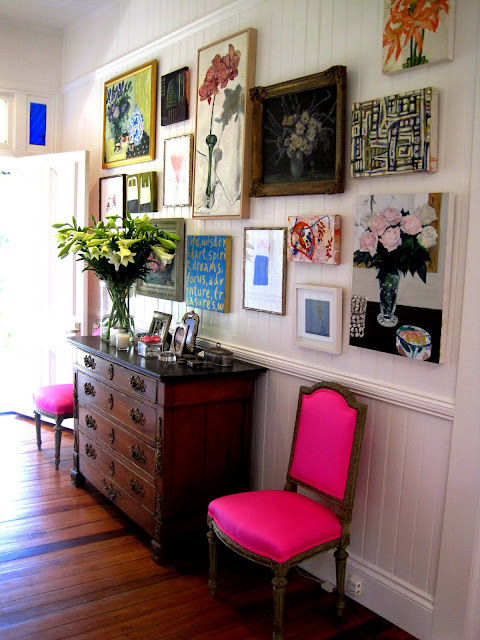 A gallery wall is a great way to add personalization, interest, color, and style to your home or work space. 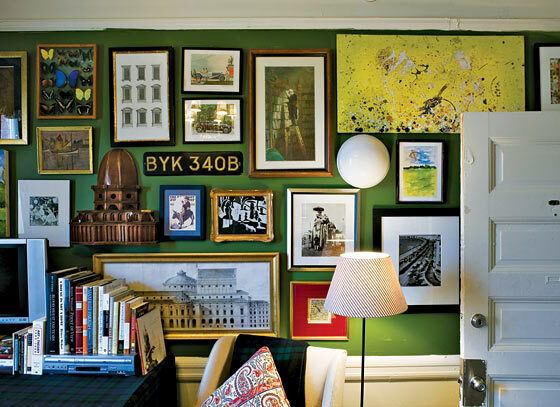 One easy way to make a gallery wall is to create one around a central theme. 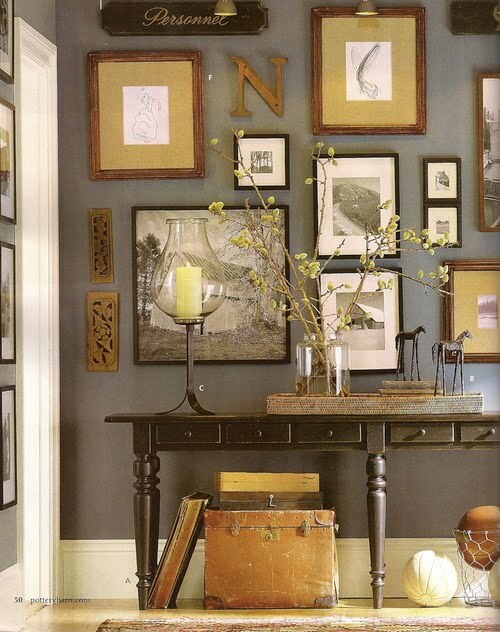 Old maps, vintage flea market art, needlepoint samplers, vintage paint by numbers - all make interesting themes for gallery walls. What's your passion? 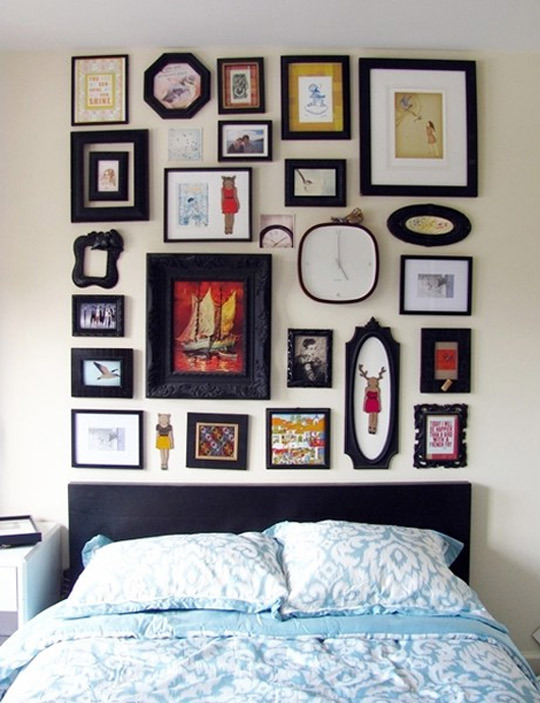 Gallery walls are a great way to display personal collections: don't keep those vintage family photos in a drawer - display them as a gallery wall with a collection of unique frames. 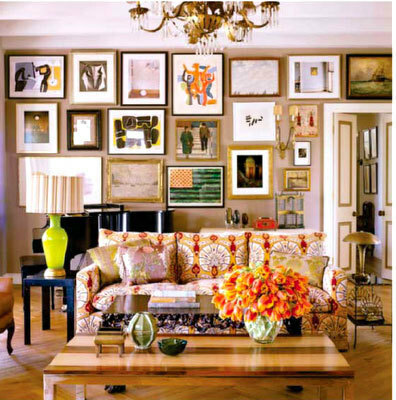 Aside from displaying art that has a similar theme, another way to create a gallery grouping is to create a display that is tied together by color. 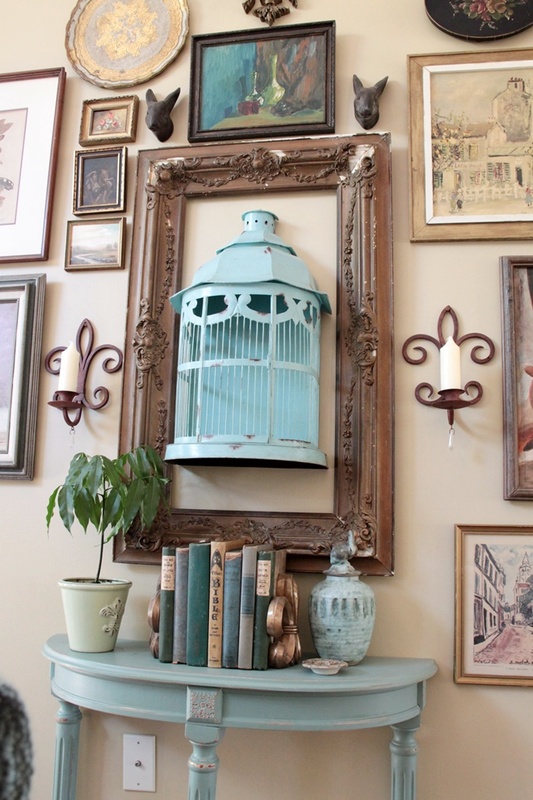 Vintage flea market & thrift shop art - makes a great Bohemian style display! Old maps: this is even better if they have a personal meaning: how about maps of all the places you've lived or visited? 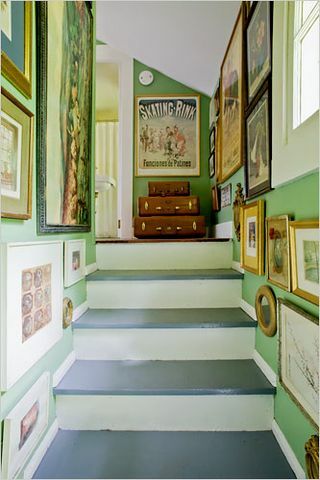 Groupings of something you like or collect, whether it be frogs, sailboats, botanical prints, leaves, etc. 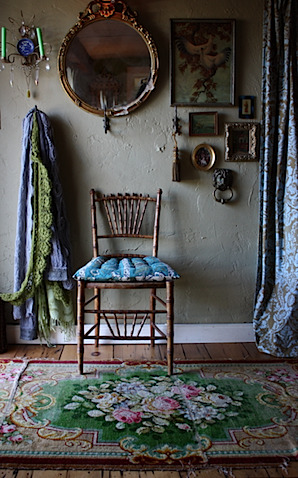 A collection of vintage prints and needlepoint. 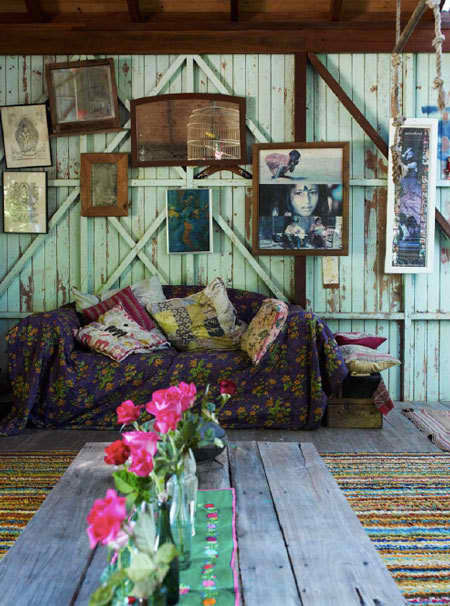 Vintage or rustic artwork from thrift shops and flea markets adds interest to a room. 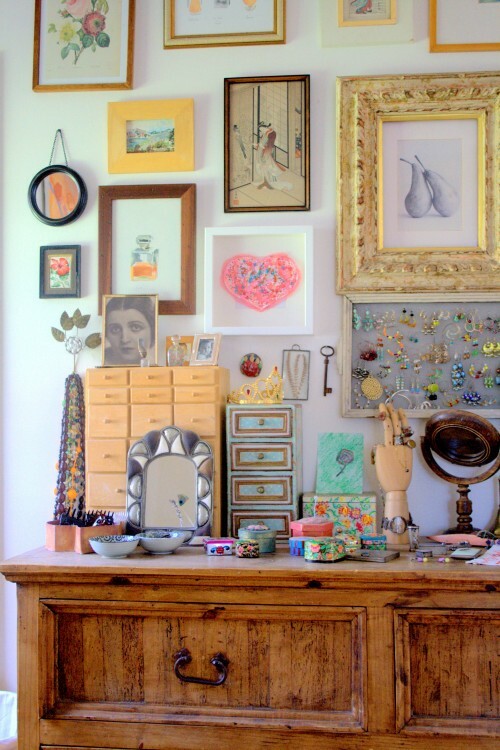 Collections of vintage items - not just artwork - add interest. 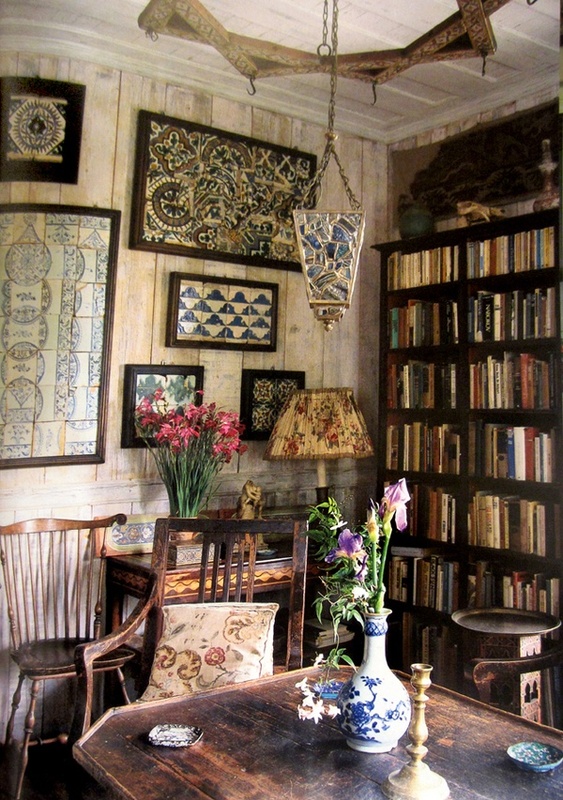 A charming collection of old tiles framed. 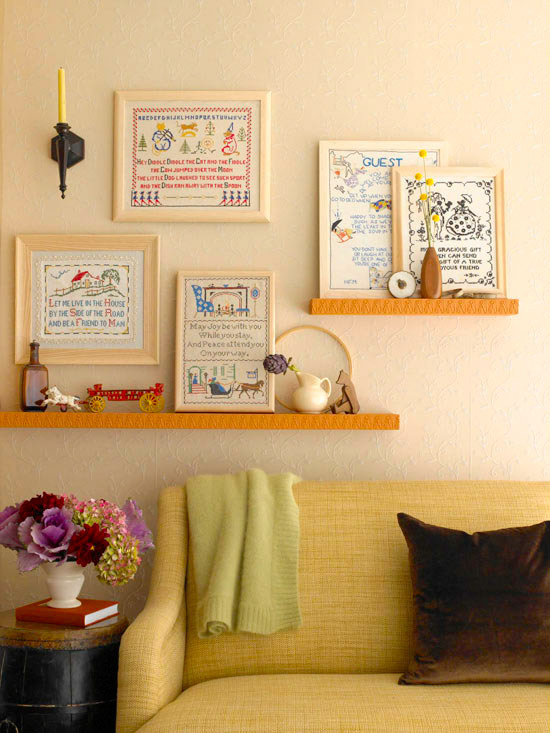 Create a display with a common theme, in this case, hand-stitched samplers. 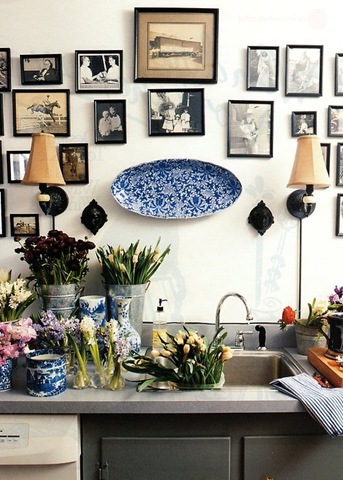 A collection of vintage floral prints. 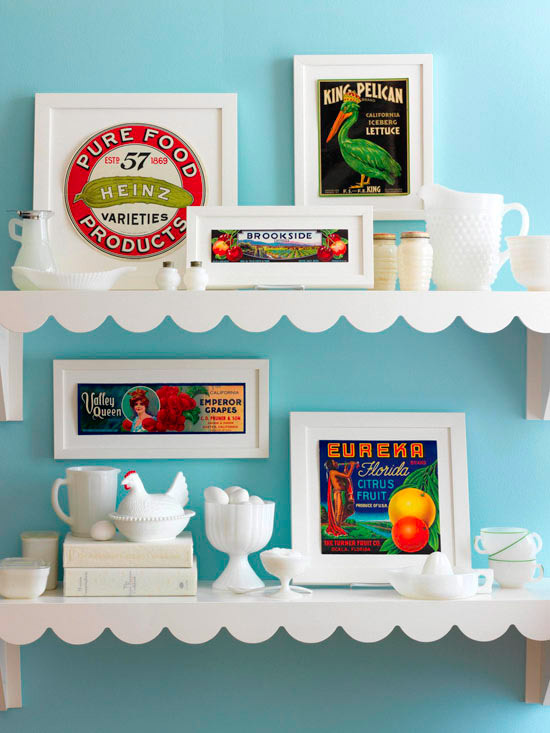 Another display with a common theme: vintage crate labels. Beautiful office space. 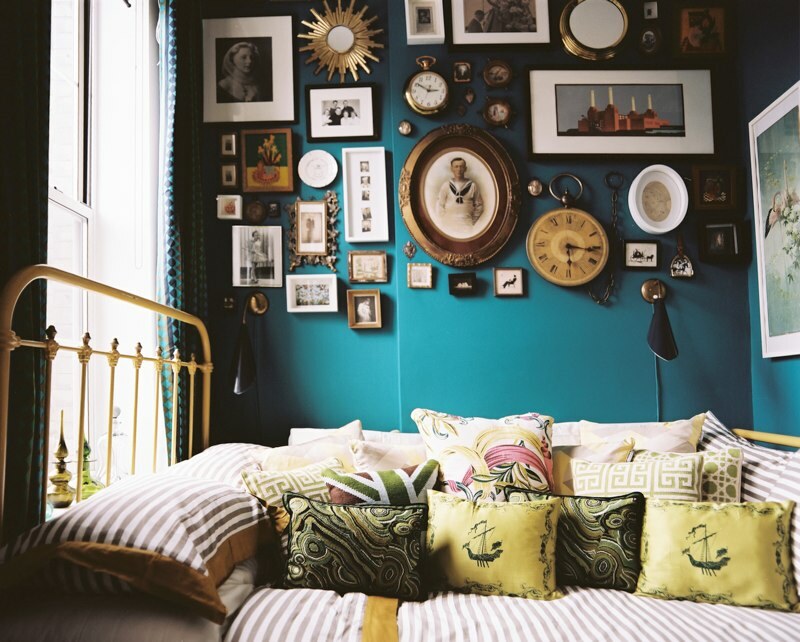 The brightly colored wall really sets off the black and white photos and frames. 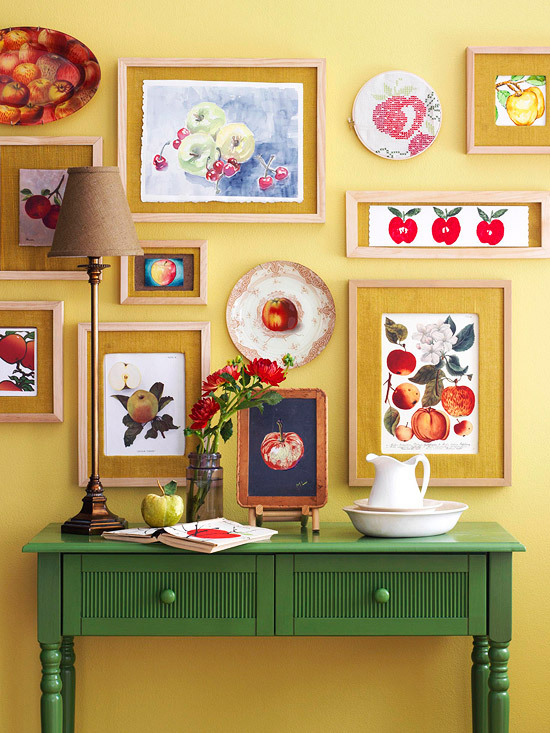 This themed gallery wall displays a collection of apples. What would your theme collection be? 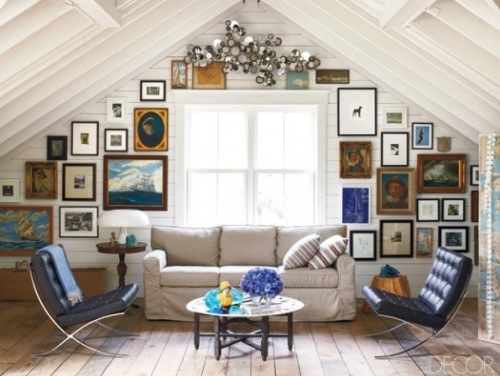 I love the look of this mixed art collection that spans from ceiling to sofa height. When I created my own gallery wall I just hung my largest "focal" picture first, and then worked around that central image, holding the pictures up in various spots one at a time until I created the balance I wanted and had them all hung. 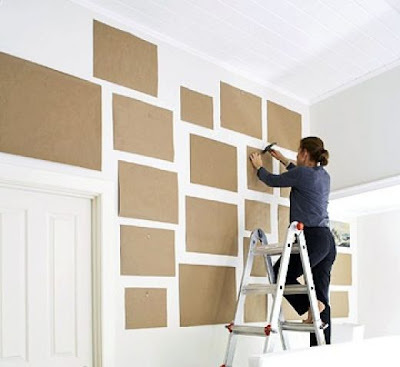 For those of you who like to have things perfectly spaced, you can create templates from paper in the sizes of your frames and tape those to your wall to get an idea of what your grouping will look like before committing with hammer and nails. Time consuming? 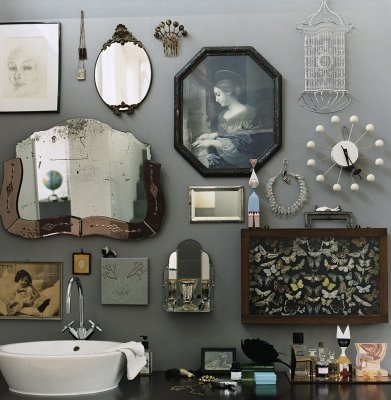 Yes, but worth it if exact and perfectly balanced is the look you are going for, or if you are covering an entire wall. 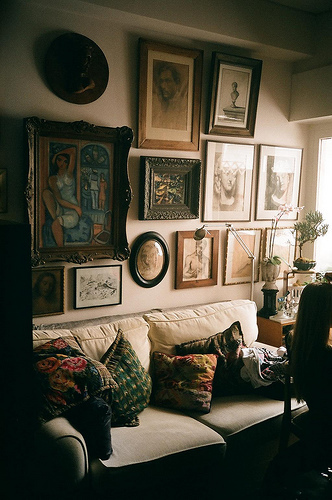 I much prefer a unplanned, bohemian approach and was happy to have all of my artwork hung with just a few minutes of thinking about what looked best next to what. 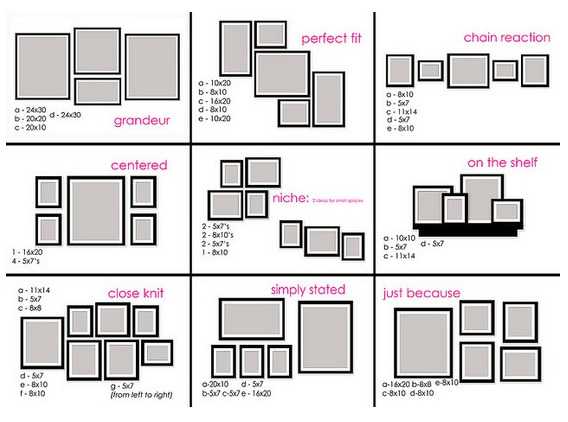 Check out some of these grouping arrangements for ideas below. 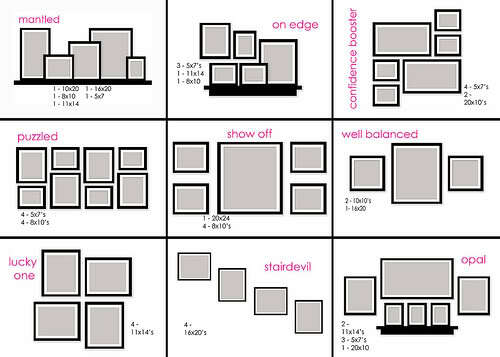 Each of the arrangements shown above is well balanced in response to the wall sizes and size of decor. 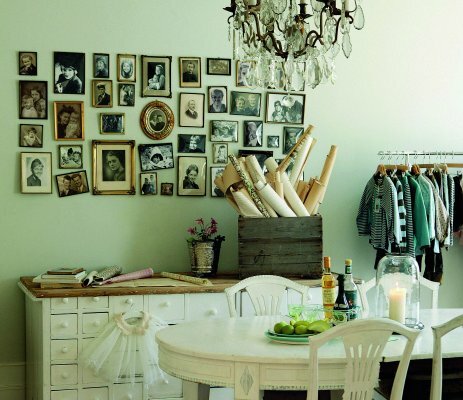 Family tree arrangements (above) are a great way to display family heirloom photos. 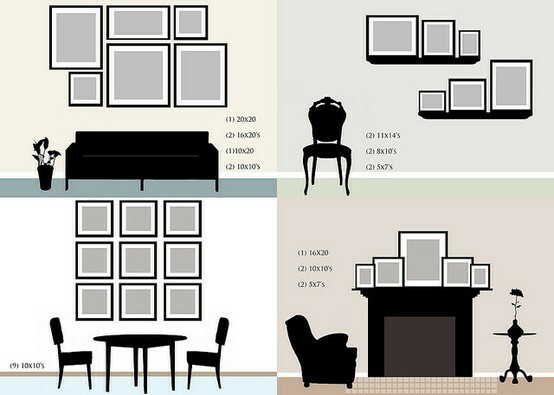 What arrangement you choose will have to correlate with what size art you are hanging. 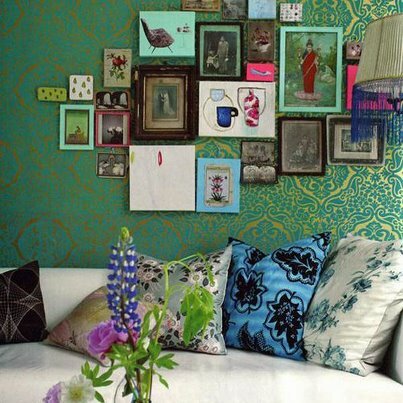 Here are some final gallery wall images to inspire you, in my favorite of all styles, Eclectic Bohemian! 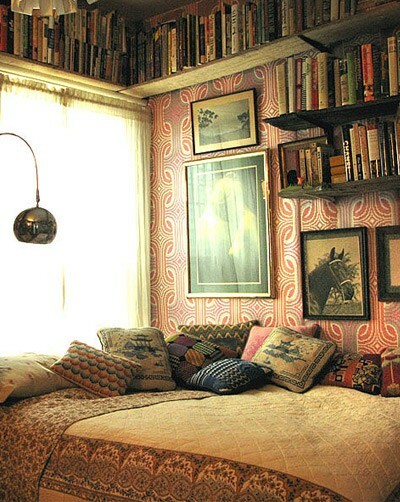 I love everything about this space: the books, bedding, wallpaper and art. 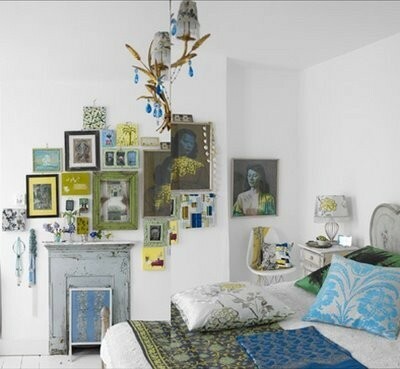 Well coordinated color ties the wall art to the rest of the decor. 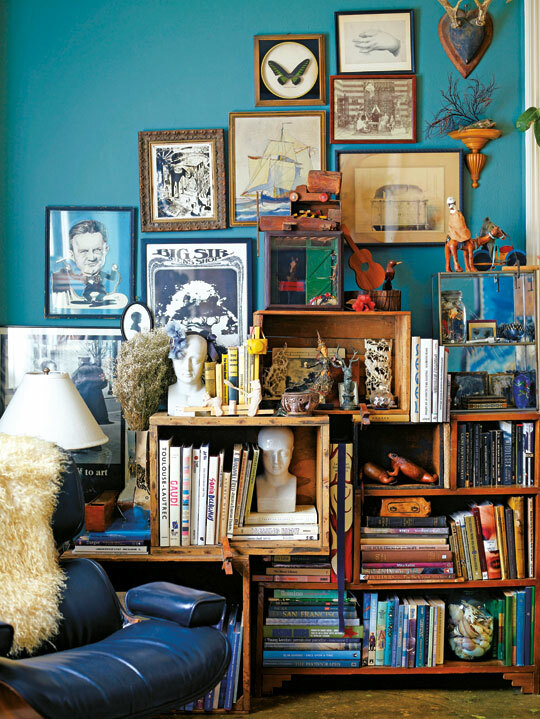 I love the use of vibrant colors in this display. 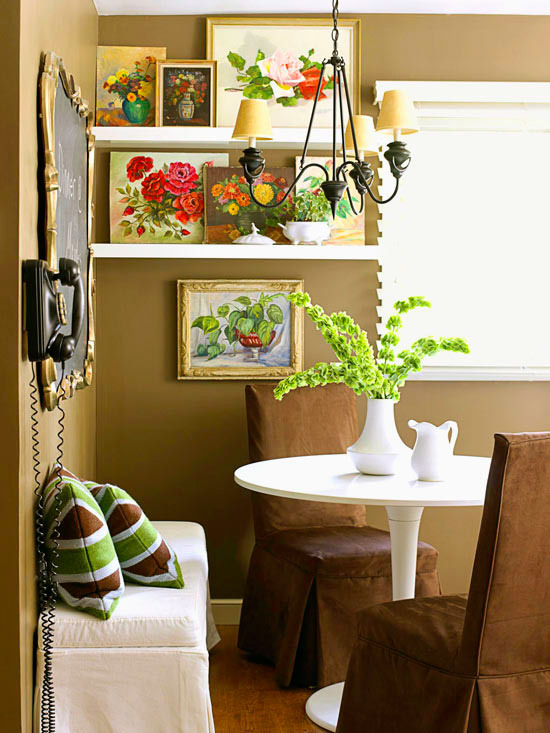 Again, the wonderful wall color accentuates the entire look. I love them all as I just love pictures. Didn't think I had room to display lots though but thinking again now :). Great finds and instructions! I have a few of these on my pinterest board already. I've been wanting to do this in our dining room for a while, so thanks for the extra inspiration! Glad you found the post useful, thanks for visiting! Thanks a lot for the inspiration and the graphs! They're just what I was looking for ;). Glad you enjoyed the post, thanks for stopping by! Oh what a fabulous post, so many ideas! 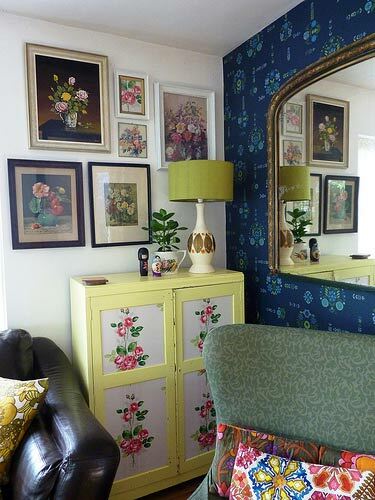 Thanks and I've got this linked to my gallery walls post too today! 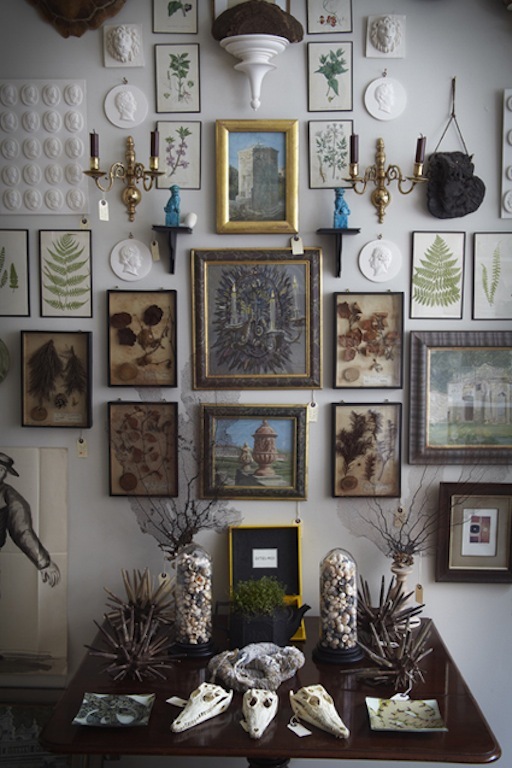 I like the examples - there is some lovely artwork and interesting displays. 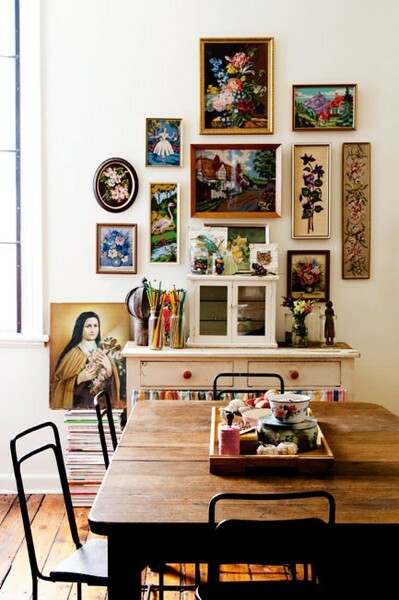 I live the print of St. Therese of Lisieux, but would certainly give it pride of place rather than just put it on top of a pile of books or magazines. It could stand alone, with a vase of flowers or a candle in front of it. She is a wonderful saint. Thanks for sharing. 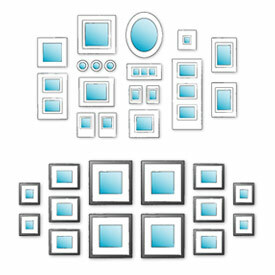 Your site gives so many ideas to fit every taste. 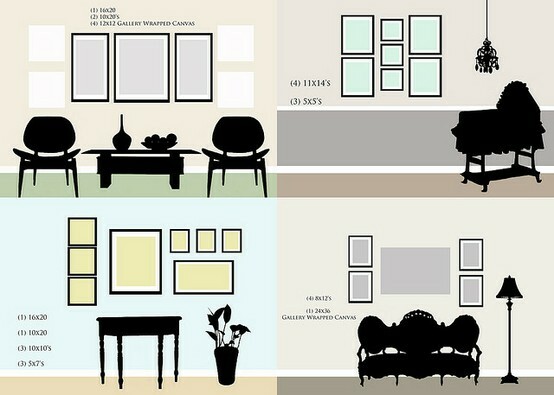 I have collected picture frames and now I have an idea of what to do with them. Great site!